These trees have many functions and names, but they all achieve the same goal - effective fundraising. How They Can Work For You? In return for a donation, the donor receives a plaque. The plaque can be engraved with text, such as the name of the donor, a departed loved one, or used to mark a memorable occasion, such as a birth or a wedding. The leaf plaque is then displayed on the tree for a set period of time, or could remain on the tree permanently. At the end of the allocated time period, perhaps 12 months, the donor can either receive their leaf back to keep as a memento, or they could make further contribution to keep it on for another year. 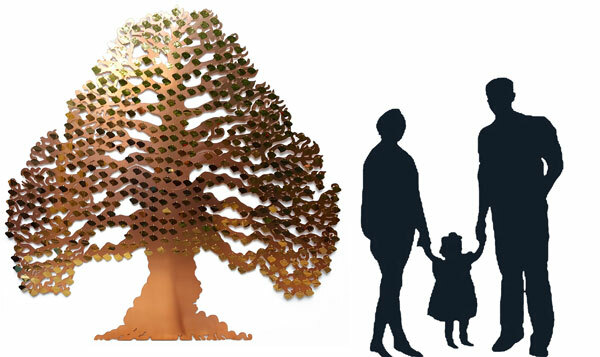 You will find that these trees are highly effective, enabling you to raise substantial funds, whilst providing your donors with a meaningful and lasting keepsake in the process. Below are typical examples of the funds and revenues that can be raised with a fundraising tree. It is of course up to you how much you charge per leaf, but the figures below give an indication of the great potential our trees provide in terms of return. Maximum return is dependent on tree design, but for illustration we are using the Eternal Tree, which holds up to 500 leaf plaques. The donation for each leaf is set by you, so you can do the maths, but there are examples below of the fundraising potential of plaques displayed for one year. Many donors give much larger amounts to the organisation they support, so you can see the huge potential that these fundraising trees hold. These trees are highly visible and attractive, drawing attention and funds to your cause. Make donation giving pleasurable and achieve a substantial income. Suitable for many types of organisation, including Registry Offices, Wedding Venues, Hospices, Hospitals, Charities and many Public Spaces. For orders or more information contact Gary or Bronwen – they would be very glad to help.